A deadly hit-and-run crash has shut down a section of a major Phoenix roadway on Friday evening. 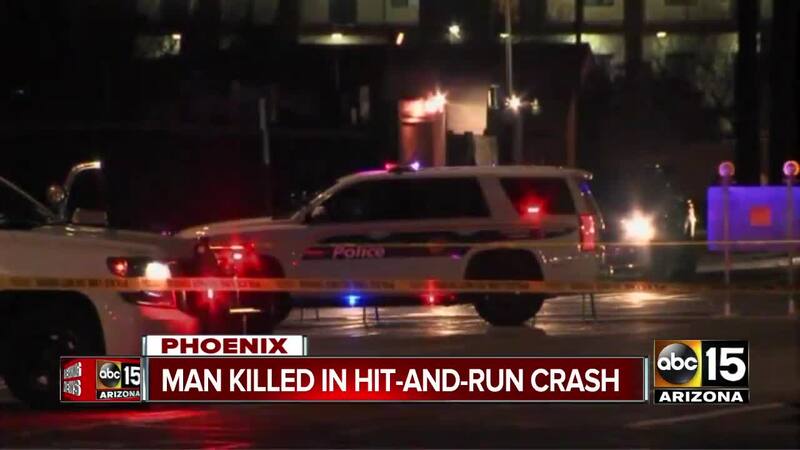 PHOENIX — A deadly hit-and-run crash shut down a section of a major Phoenix roadway on Friday evening. According to Phoenix police, a man was hit while crossing mid-block on McDowell Road near 43rd Avenue. Police say the victim, later identified by police as 67-year-old Pedro Pinon, was pronounced dead at the scene. Witnesses on scene told police that a silver or white truck, described as a Chevy Silverado with front-end damage, left the scene heading eastbound after hitting the man. Area road closures were in place while police investigated and searched for the suspect vehicle. Police say the suspect vehicle fled the scene into a nearby neighborhood and has not yet been found. Anyone with information about the crash is asked to call Silent Witness at 480-WITNESS or Phoenix Police Department at 602-262-6151.